A meal isn’t complete without a good dinner roll. 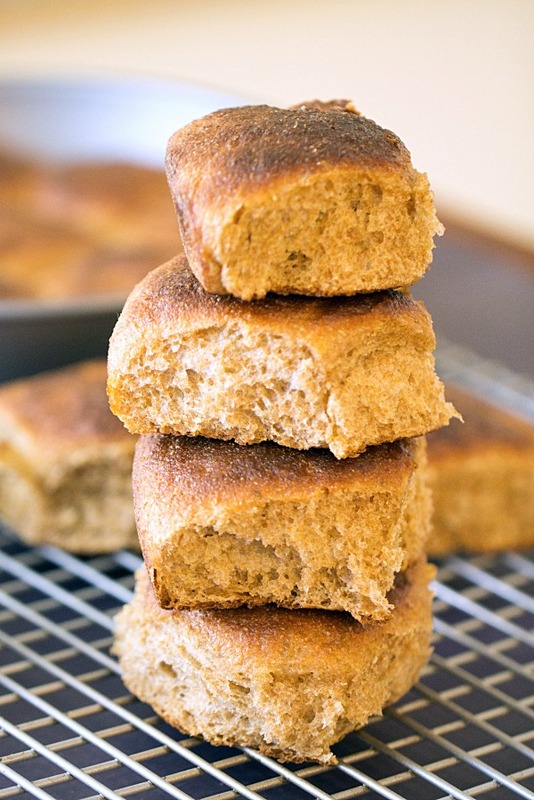 These Whole Wheat Dinner Rolls are made with 100% stone ground wheat and don’t contain any refined sugars! BBQ. That is what was going on the day I made these Whole Wheat Dinner Rolls. Now normally when we have a BBQ, I like to make cornbread. Cast Iron Buttermilk Cornbread. But I’ve sorta been on a healthier foods kick lately so I wanted to make some healthier dinner rolls. Plus, I had a package of 100% stone ground whole wheat in my pantry so why not? Not that any BBQ food is really considered healthy. But it sure is good. Finger lickin’ good. The dog thinks it smells good too. She goes completely nuts over it and loses all train of thought except for “meat.” We give her a few of the rib bones and she goes to town on them. She ends up hiding them around the house. Trust me. Six months from now, she’ll drag one of those bones out. So about these rolls. They are tasty. Tasty enough to take a huge bite out of. Take a bite out of rolls. 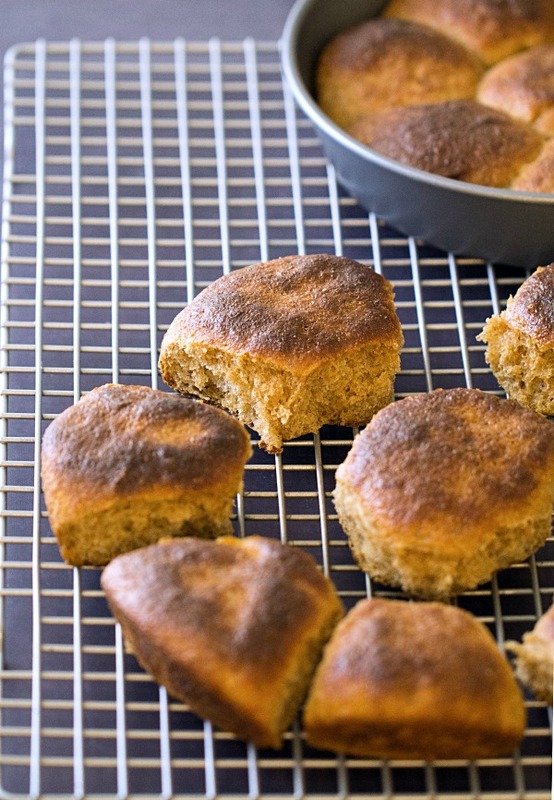 Whole Wheat Dinner Rolls. These rolls are a little denser than your typical dinner roll. Whole wheat tends to do that to a roll. 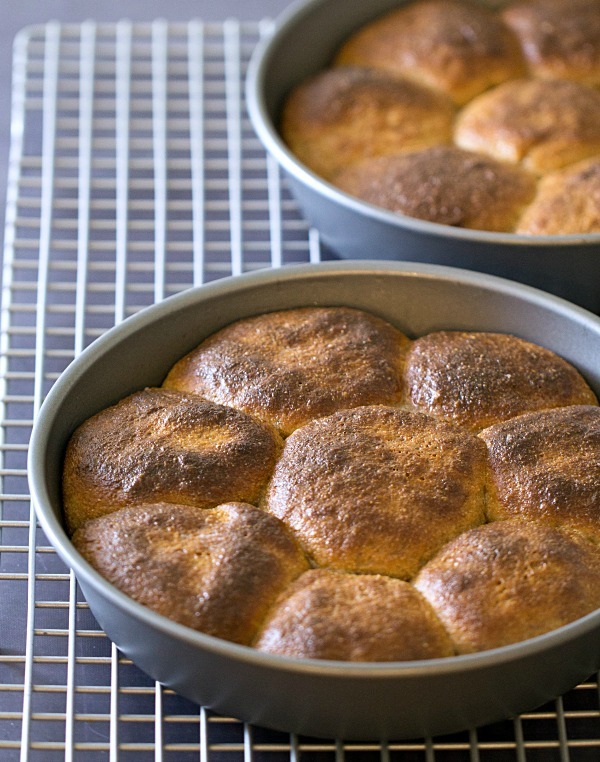 If you prefer a fluffier roll, I suggest using half all purpose flour and half stone ground whole wheat. The rolls won’t be as dense but you’ll lose a little of the healthy properties by adding the white flour. But it’s whatever you prefer. After all, you are the one eating it, right? You’ll need a few hours to prep these rolls. Don’t worry. Most of it’s inactive prep time. Whole wheat takes a little longer to rise than white flours. I suggest starting your dough in the morning so you have plenty of time to prep, rise and bake. They might be ready in time for a late snack but surely ready for dinner. Prep. Rise. Bake. Slather with butter. Enjoy. Sprinkle the yeast over the warm water and let sit until foamy, about 5-10 minutes. In a saucepan, bring the milk to a boil. Remove from heat and let cool to 115 degrees so it does not kill the yeast. Attach the dough hook to your mixer. Place the milk in the bowl of a stand mixer and add the salt, yeast mixture, honey, 6tbsp melted butter and eggs and mix until well blended. Add the flour and mix on low until combined. Increase the speed to medium and knead for 8-10 minutes. Check the dough after a few minutes of kneading. If it is too sticky, gradually add more dough about 2tbsp at a time until the dough is elastic and doesn't stick to your fingers when touched. Remove the dough from the bowl and place in a greased glass bowl. Cover and let rise until double in size. For me, this took about 2 hours. Punch down the dough and roll out into a 10x12 rectangle. Roll up from the short side until about 15-20 inches in length. This is approximate. I didn't actually measure mine. Cut the dough into 16 pieces. I did this with a knife. Then roll the dough into balls and place 8 pieces into a 9 inch round cake pan. You'll need two pans. To place in the pan, just put one roll in the middle of the pan and then surround with seven rolls. Cover and allow to rise until double in size. This took almost an hour. Bake at 400 for 14-18 minutes or until golden. Watch your rolls as they bake. If they start to get a little too dark on top, cover with aluminum foil. Remove from the oven and brush with the remaining 2tbsp butter. 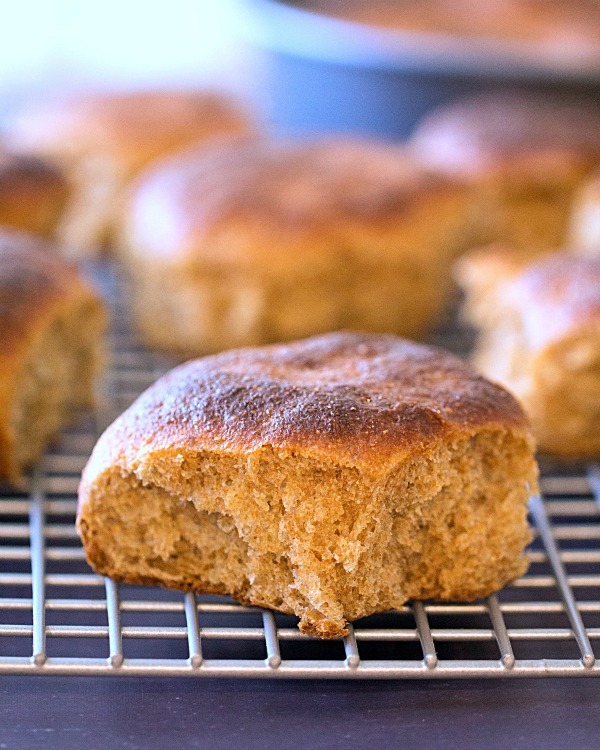 There is nothing better than homemade bread or rolls!! I could certainly slather several up with butter and chow down! I love the bbq too! I need to invite myself to dinner. Julie, The rolls look wonderful. 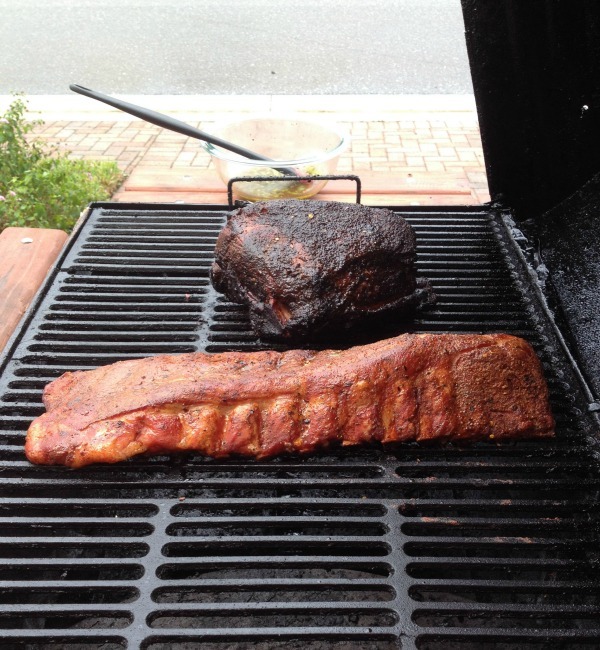 The ribs and roast on the BBQ make me long for summer in Virginia. Thanks for sharing. I completely agree – a meal is not complete without a roll! 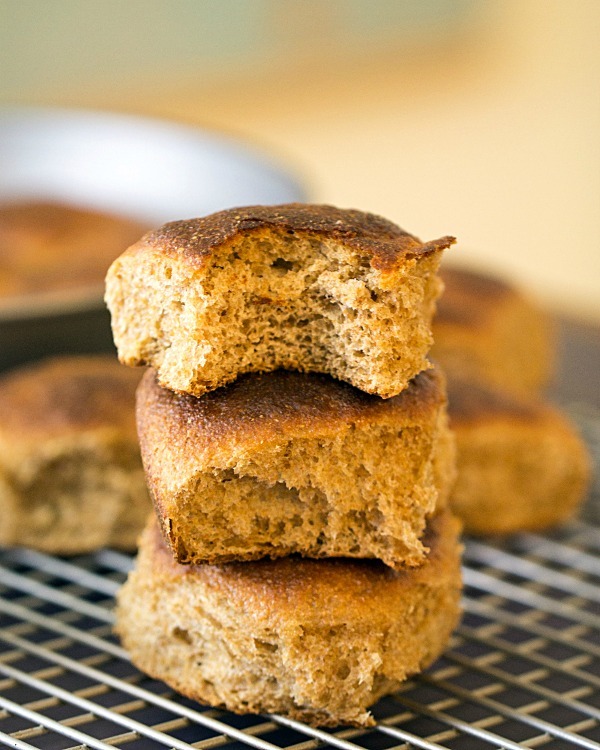 These look so good – I love that they are whole wheat! Makes me feel a bit better about eating more than one! I can never resist a warm roll from the oven! Pinned and making for dinner soon! Awesome! I’m glad you were able to get a coupon to Whole Foods. I love that store! Thanks for stopping by. I’m glad you enjoyed this recipe, Ashley! You are right about that, Renee! Thanks so much for stopping by! Enjoy your weekend. Can you imagine all of the awesome food we would have on a daily basis if we were neighbors? It would be epic! Thanks so much for the pin, Gloria. I hope you enjoy the recipe! I read my email and had to run straight over here, There’s nothing better than warm dinner rolls! Pinned. Great looking yummy rolls! So many times we have dinner and I wish we had some rolls, now I know they are easy enough to make! They are pretty easy to make, Pamela! Thanks for stopping by! I agree, a good roll at dinner is the best. This looks so good. Julie these rolls are gorgeous! I love baking bread too, can’t wait to try these. There isn’t much better than homemade dinner rolls! So good! Thanks so much, Krystle! I found the stone ground wheat over in the organic section of my store. If you have a Whole Foods or Fresh Market near you, you should be able to find it!